I was designed to make sure that nothing disturbs you from reading. With many features I’m staying clean and do not get in the way. And I’m one of the fastest readers on market. I give you a fast interface, fast feed updates and fast sync with apps. Use Reeder, Feeddler, Fiery Feeds, Lire, Web Subscriber, FeedMe and Vienna RSS. On iOS, Android and Mac. Unread, Readably and ReadKit apps work with bazqux.com set as a Fever server. Read the full content of truncated feeds inside the reader, powered by Five Filters. Do not leave reader to check comments. Read them here. And it will track what was read and display only new comments next time. Just like with articles. You can choose your view for each feed. List, mosaic, magazine, expanded. And read folders and the latest stream in a mixed view. Enter the URL in the “Add subscription” dialog to add the page like a regular feed. Search in feeds or tagged articles. Hide uninteresting and monitor interesting news with filters and smart streams. 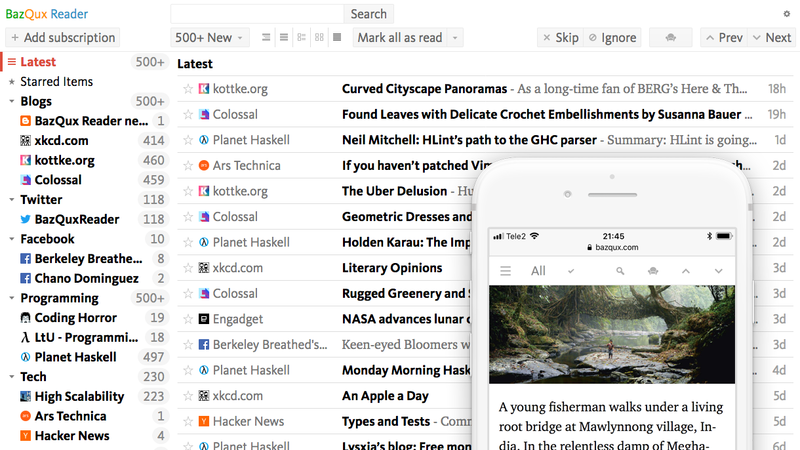 Organize your favorite articles with stars. Make your library with tags. Share articles via E-mail, Twitter or Facebook. Save them to Pocket, Instapaper, Wallabag, Evernote or Pinboard. Being paid service reader updates feeds of paying and trial users only. It doesn’t get rate limited by site owners for fetching millions of free users feeds and updates your feeds in time. It designed for the needs of paying clients not for the nice screenshots and reviews. And you get real customer support here. And we all know—free readers close. Sign in, find your favorite feeds or import OPML and start reading!